The lure of the river was too much to resist. I was back again last night, choosing to fish beyond the beach, and yet again having to batter down the balsam to make myself comfortable. The river was slower and clearer still. The sky clouded and a stiff breeze blowing from the south west - although the bank behind me provided shelter and the tops of the trees on the wooded bank being my only indication of it. As there was still some feeder mix left from Monday that was to be my approach again. This time I'd left the big feeders behind (along with the umbrella to keep the weight down) and topped up with 2oz Korum cage feeders. It didn't take long for something to find my baits. The rod tips indicating all manner of twitches and pulls. In the shallow margins small fish were feeding and flashing. Putting the binoculars into action the larger ones looked like small chub, the others could have been minnows. I threw in a couple of boilies and some feeder mix and they homed in on it immediately. Swifts and martins were soaring high above the trees, two herons flew across the river towards the next bend upstream. The valley was at peace with itself. The air temperature was a little lower than Monday, and as the sun set the air cooled further. I stood up to wind a rod in for a pre-dark recast and saw two herons on the upstream end of the beach. They must have sneaked up river from behind me. One flew away as soon as it saw me rise above the balsam. The other eyed me with suspicion for a few seconds before doing likewise. Slugs were around in the vegetation as was a caterpillar of some sort. I had to photograph something to brighten the blog! This swim is one I've fished before and had a couple of nice fish from, but it's not one I've caught numbers of fish from. The plucks and taps continued after dark. I wasn't too concerned by the lack of barbel action. As it grew darker so the clouds closed up and the temperature rose again. The fleece I had put on earlier was almost superfluous. At ten to eleven the upstream rod, which was fishing nearer the middle of the river than the far bank in order to avoid the tackle grabbing snags, came alive. As soon as I bent into the fish I had the feeling it was foulhooked. It had that same inert feel the foulhooked fish on Monday gave me. Sure enough, the hook was well outside the mouth. Some years ago I had a spate of this happening, but after adding the intermediate swivel to my hooklinks foulhooked fish had been notable for their non-appearance. Maybe an odd one each season. Without changing my rigs I've had two in two sessions. I can only put this down to the combination of low flows and swimfeeders. I say this because my rigs have been tangling more frequently, too. Not often enough to worry about, but far more than is normal. What I think is happening is that the hook/bait is settling directly on, or very close to, the feeder. This is likely to cause tangles if the hooklink drops onto the feeder. And it might also cause the hooklink to loop up off the river bed, thereby creating a situation where a barbel could catch the line and drag the hook into a fin. Pure conjecture, but in stronger flows with a bag of pellets on the hook I know that the hooklink straightens out downstream of the lead, because I've watched it doing so in shallow water. If the Ribble wasn't so rocky I could solve the problem by drawing the feeder towards me as it settles. Only doing that has a tendency to drag it into a snag. Back to the bags. The next hour and a half was spent listening to a tawny owl, and making squeaking noises back at it. The owl responded when I got the sound right. The taps and rattles continued sporadically, with the occasional 'bat bite' in between, but nothing more positive. The rain let up but I still took the brolly with me just in case the forecast was wrong. A week on and the river had risen and fallen, almost back to summer level, and was fairly clear with a hint of a peat stain. The wind was minimal and the flow likewise but without the stagnant feel it had during the heatwave. Walking through the field, the grass growing lush again after being mown earlier in the summer, wet feet reminded me that I need new boots. I had, however, put on my waterproof overtrousers which proved a good move when I reached the bend. I had the river to myself again and fancied a shot at the beach. I doubt anyone has fished it all season as there was not a path to be found through the balsam. When the jungle warfare was over and I reached my destination I found it had changed dramatically since the last day of the season. All the pebbles were now covered in sandy silt and there was amphibious bistort growing near the water's edge and balsam encroaching from the landward side. The more vegetation sprouts, the more silt is deposited and sticks. And so the land builds up on the inside of bends. With the changes it was hard to get my bearings and I set up in the 'wrong' place. When I noticed the willow sapling that I used to fish by I moved my gear and my confidence level rose. With the water clear I wasn't expecting any action until dusk, though. Around eight I heard a noise in the balsam behind be and a sea trout angler materialised. It must be great carrying just a rod and a folding net for your fishing. Lugging a heavy rucksack and rod quiver a long way is getting too much like a chore for me. It's a case of loading up, looking at the ground and not stopping for a breather these days. It's the only way to get there without feeling liek it's an endless trudge. Like me, the sea trout angler wasn't expecting much to happen before dusk so we had a chat while we waited. I'd just said it would be half an hour, at least, before I got a bite when the downstream rod arched over and the baitrunner did it's angry wasp impression! At first the fish felt small, then felt bigger but looked small in the clear water. A nicely conditioned fish that weighed in between my initial guess of nine pounds when netted and eight when lifted in the sling. Like a fool I had only got my five ounce cage feeders with me. I was half expecting rain so left the PVA and pellets in the car. The feeder mix I'd thrown together was a bit better this time, not too sloppy, not to claggy. Just right with the pellets in it not turning to mush. The feeders were way to heavy for the conditions. I rummaged in my lead bag and found some blockend feeders still there from my end of season chubbing. I attacked two with my trusty penknife. The oval Drennan was easiest to chop the end off, the Korum required more work. I even tried melting the end with the flame from my cigarette lighter. Needless to say I lost the Korum in a snag on the first cast. I couldn't be bothered modifying another and went back to the heavy artillery on the upstream rod with the two S-Pellets. A kingfisher blazed it's blue way downstream, wrens sang loudly in from the wood opposite in the still air, and the unmistakable song of a grasshopper warbler could be heard as the light began to fail. I was surprised to hear the warbler's incessant trilling this late in the season. Around ten the downstream rod pulled over with a short zuzz from the baitrunner, followed by another dip of the tip. I pulled into a dead weight and thought I was dragging a branch upstream. Only the branch kept going upstream when I got it close. Then it woke up and I realised I'd either hooked a really big barbel, or a smaller one that was hooked in a fin. It turned out to be the latter, a fish of some seven pounds. By now the first sea trout angler had been joined by another. The sound of their lines hissing through the rings carrying through the night. One was getting a bit close, not too close for comfort, but close enough when the boilie rod lurched into action. A good scrap ensued and a fish of six or more pounds was netted and released without leaving the water. I turned to re-bait only to be disturbed by the sound of line being pulled from a fly reel. A lot of line. I spun round and grabbed the upstream rod. It had been a baitrunner all along! This fish also fought well and suffered the ignominy of the weighsling. The scales made it a couple of ounces heavier than the first fish of the session. I sorted out the chaos and settled back. The night was warm enough for me to leave the fleece in the rucksack and just pull on a sweatshirt. The cloud cover began to break up and a lone star shone. After an hour of inactivity, with both sea trout chasers already gone, I packed it in for the night. Somehow I managed to find the path I had made through the balsam and followed it without tripping or stumbling. Then I got my head down again for the slog back to the car. After a lot of chasing insects around with my camera I went for a run out on Friday afternoon to chase after some birds. The location I was heading for also offered me an opportunity to look at a water that is known to produce some rather nicely sized rudd. On pulling into the car park overlooking the 'lake' I was dismayed. Not so much a mature gravel pit, it's been there a goodly while, more a water-filled crater. There was no bankside vegetation except grass - and that neatly trimmed. I didn't even walk to the water's edge before leaving. The rudd would have to be of record proportions for me to fish the place. The birds were obliging, although I didn't get any photos worth bragging about. 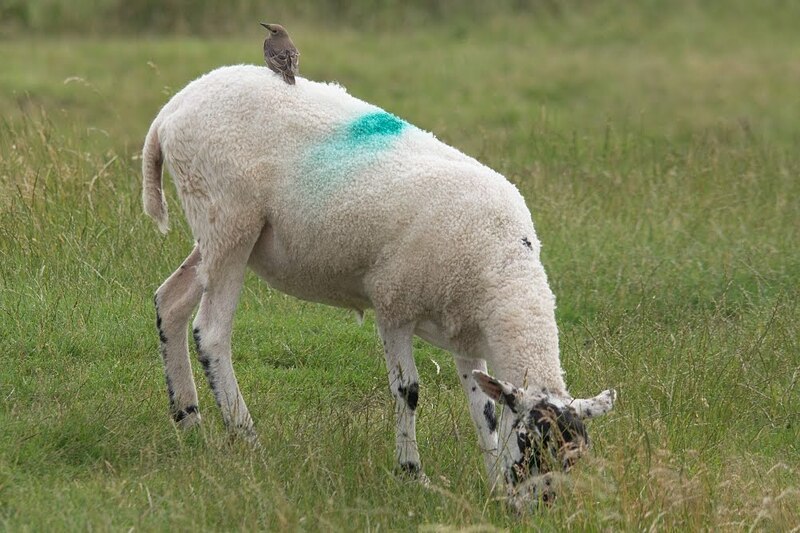 There was one mildly amusing one of a young starling and an oblivious sheep. After Friday the prolonged heatwave broke and the weather returned to our usual summer pattern of rain, followed by more rain, no doubt provoked by the recent hosepipe ban. This meant that photographing wildlife was not going to be much of an option. I always like Sunday nights on the river, so that was what I geared up for. Until I checked the on-line forecast that is. Torrential rain was predicted from 10pm onwards. I don't mind rain in summer, but torrential rain when I'm packing up and making a long walk back to the car isn't my idea of fun. I changed my mind and stayed home. Popping my head out of the back door while waiting for the kettle to boil around ten I felt a few spots of rain. I guessed that was the start of the deluge and felt quite smug. When I went to bed a couple of hours later the pavement was still dry. I felt disgruntled. More so when I looked out again around 4am and the street was still dry. Bloody weathermen. Monday morning was damp, however, but the skies brightened around noon and I nipped out to photograph some butterflies I'd found on a day too windy to get any good shots. As soon as I parked up the heavens opened again. There was no respite. The wind was light and the clouds slow moving. I went back home. Within an hour the sky's were clearing again and the urge came upon me. Sod the rain that was forecast. An early tea was eaten, I let the rush hour traffic subside, and at six I was on my way to a river I hoped would be in fine summer flood form. Conditions looked perfect as I left my car alone in the car park. There was around two feet extra, or a little more, of of perfectly tinged warm water in the river. The rain was nothing more than an occasional spot, the air was warm, the wind non-existent. Superb. Although I dropped my rods, chair and bait bucket by a swim I knew quite well I then carried on for a look further upstream. I came to a swim I had yet to fish, and it looked inviting. Not only was the bank quite cosy to fish, surrounded by balsam and reasonably flat, there was a small slack by the bank and a lovely crease angling away from the swim. I dropped my rucksack on the damp ground and made to return for the rest of my gear. Because of the rain I was using swimfeeders rather than PVA mesh. I'd tipped a load of Sonubaits crushed halibut pellets, Hemp and Hali Crush and Tuna Spod Mix in a bucket to use as feed. Dunking this in the river I rather overdid the water content. Some was drained out and the sloppy mess allowed to thicken up by absorption. By the time I had the rods sorted out it was almost perfect, with a bit of a squeeze to compress it in the feeder. 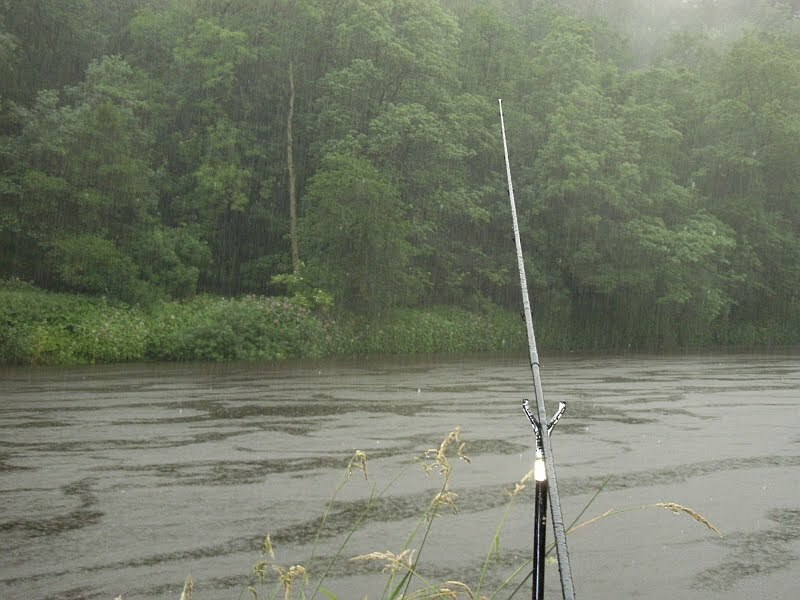 The rigs were the same as last time out, and I didn't even bother putting on fresh baits as the rain had arrived and I wanted to get the brolly up and make myself comfortable. I could change the baits when I'd had a brew from the flask and cooled down from the walk. As it turned out I forgot to change the baits. Not that it mattered. After one recast and forty minutes the downstream rod, fishing the banker spot where the flow picks up at the tail of the eddy, began to pull down and spring back slowly. A dull fight ensued, the fish playing doggo and only occasionally wagging its tail. I guessed the fish at sevenish pounds but weighed it as it looked chunky. 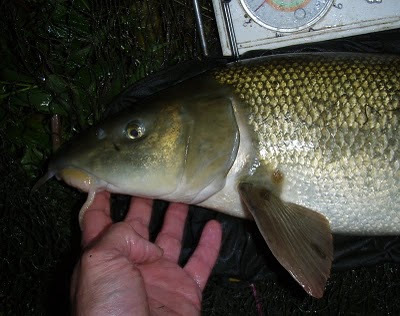 A typically pale floodwater barbel of 8lb 11oz. That was easy! At eight thirty the same rod was almost dragged off the rest by a fish that pulled much harder, heading upstream at one point and leading me to imagine something much larger than the five-ish pounder that was netted. Time for a change of bait. Disaster! There was no baiting needle in my tackle box. There was one on the dashboard back in the car park. One I'd meant to put in the box. Damn. I was about to wind the upstream rod in and make the walk back when I remembered there should be a stringer needle somewhere in the box. There was. Phew. Two more boilies, a large one and a small one, were put on the downstream rig, and the S-Pellets were replaced on the upstream rod. It was an hour before the next bite. A typical upstream bouncer. Again a good scrap ensued as another small fish was played to the net. When fishing for barbel in coloured water the only clue you get to their size is when they roll on the surface. They really can fool you with their power in the extra flow. The fourth fish came to the downstream rod and felt a better fish. It took a fair bit of line and had a dogged power. In the net it looked as good as it had felt. No fooling here. The scales denied me a double, but there's more to enjoying your fishing than putting notches on a rod handle. I was surprised to see a few fish lice on this fish. Perhaps the recent low levels and slow flows have benefited them. At times the rain had been heavy enough to make bubbles on the calm surface of the river and enough noise on the umbrella to drown out the radio, at others it was so light it was barely noticeable. On a warm summer evening it wasn't unpleasant. When darkness set in the chub bites started first, fast jabs that amounted to nothing, then the bat 'bites', tremors that set the rods sacking from side to side. at twenty-five past ten the pellets were taken by a fish that steamed off into mid river. Another scrappy five pounder. Twenty minutes later it was the turn of the downstream rod. This was another eight pounder. Or possibly the same one I'd caught earlier as it looked sort of familiar, having a slightly glazed right eye. 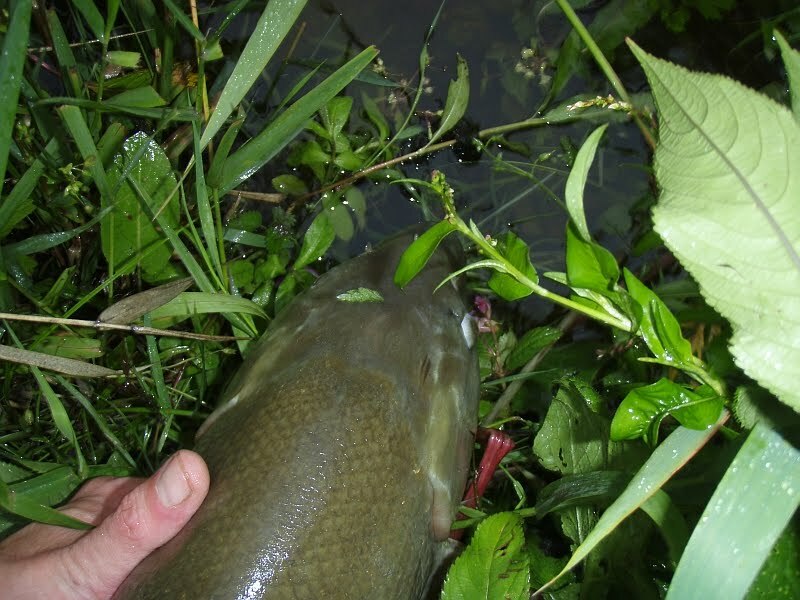 I've often found that as midnight approaches barbel bites tail off. After a biteless hour I took advantage of another dry spell to pack the gear away and leave. What little rain there had been wouldn't have made much impact on the Ribble. Apart from the fact it hadn't lasted too long and the river rises and falls quickly, the ground will be so dry most of the rain will get soaked into the earth like a huge sponge. Even so I was itching to catch a barbel. So much so that I set off earlier than planned, which meant I spent about an hour longer twiddling my thumbs waiting for dusk than I need have done. This wasn't all bad as it gave me time to remember what a special place the valley is. I had been surprised to find one vehicle parked up when I arrived. Judging from the personalised numberplate on the fancy looking 4x4 I was expecting a game angler to be on the bank. It turned out to be two guys float fishing with two cheap looking telescopic rods. It seems strange to me that people who aren't short of a bob or two and obviously like nice things, judging by their motor, fish with cheap and nasty tackle. Not that cheap and nasty gear stops you catching, but quality gear does two things; provides an aesthetic pleasure to the practical aspects of angling, and means you can't blame your tackle for your failures! Last season's favoured peg looked well trampled. There was a strong wind blowing up river and I'd left my brolly at home. The air was warm, but the wind still had a cooling effect so I set up a little upstream where I could get tucked down the bank and get some shelter. In a normal year the balsam would have been towering over me in this spot, but this year it's well behind everywhere I have seen it. The rods were still rigged up from teh final day of last season. I did replace the baits before casting out though! One rod fished two 14mm boilies downstream and the other one an 11mm S-Pellet upstream - both with the ubiquitous PVA mesh bag of mixed pellets and Hemp and Hali Crush. The H+H Crush was added to the bucket by mistake, but it seems to stay in the bags well enough. Despite the broken cloud cover, which congealed after dark, darkness was slow coming. The isotopes didn't start to glow until well after 10.45pm. Just before ten the downstream rod had rattled in the rests leading me to expect an eel. The wriggling creature on the end of the line reinforced that suspicion. However it turned out to be a chub of a couple of pounds. I hadn't blanked and the river season was under way. The wind eased, as it so often does, as the light faded meaning that the air temperature stayed up, more so as there wasn't a star to be seen through the clouds. No need for the bunnysuit, which was just as well because I hadn't packed it. At eleven thirty the downstream rod was in action again. This time I was alerted to the take by the sound of a Baitrunner and the sight of the spool spinning as the rod bowed over. The fish pulled well for its weight. Not quite seven pounds it was a fine example of the attraction of barbel fishing. Feisty fish that are easy to catch! I hadn't been too happy with two 14mm boilies on that rig, the gap between bait and hook wasn't long enough for my liking - even though the chub had been nicely hooked. I was now using one 14mm and one 10mm boilie which looked better to me. I'd also added a second pellet to the other rig for the opposite reason - the gap looked a touch too long. It wasn't quite an hour later when the same rod was off again. A similar sized fish which fought equally as well as the first. Should I stop out until dawn and see how many more would turn up? I only had a flask with me. Some grub would have been a good idea to get me through the short summer night. The next take looked like it could have been caused by an eel. A slack liner that did no more than remove the tension from the braid. Sure enough it was an eel. Bah. The upstream rod bent over more determinedly as the spool spun fifteen minutes after the eel had disturbed it. This was no eel, and it felt more powerful than the other two barbel had. It proved to be an ounce shy of nine pounds, I was weighing the fish to get me back in the swing of guessing their weights after a long time without seeing a barbel. I slid the fish back and it did the lying motionless in the shallows trick. I kept an eye on it as I rebaited and recast, and afterwards, to make sure it was okay. Until the time I looked and it had gone. There was no flow to speak of in the edge, so it hadn't rolled over and been washed away. It had simply recovered its composure and sidled off. One o'clock came and went, as did two. It seemed pointless leaving then, I might as well stick around and wait to watch the sun rise over the fells. As it turned out there wasn't a sunrise as such. Light slowly came to the sky, starting with vague hints around three when pale objects like the sleeping swans appeared a little more visible. The sky was still cloudy and the morning twilight lasted for about an hour before the head-torch was redundant. During this period, before the dawn chorus began but after oystercatchers and curlew had called, the upstream rod had twitched. Not a full-blooded take, the bait had been thrown well upstream, but a slack liner of sorts. This was another eight pounder, and another good puller. Unlike it's predecessor it powered off on release. By four, in dull morning light, I called it a night and set off for bed. The drive home saw me pass the usual crows and magpies cleaning up the night's road-kill. The highlight of the journey being a tawny owl perched round shouldered on a high street lamp. It looks like the pellet bucket and low chair are back in residence in the back of the car.